The JIRP academic curriculum is built around six student research projects. Each project group of three-eight students work under a team of faculty advisers to develop a research question, design and carry out field data collection, analyze results, and present findings in several formats. Each summer’s research projects are set up depending on the faculty availability, so the projects are slightly different every year. Our Academic Council are starting to plan for the 2019 season, but in the meantime our 2018 projects are linked below. We expect the 2019 season to bring research that is of a similar caliber and scope. The 2018 student research project proposals and presentations are linked below. Please also check out the previous years’ projects to get an idea of how we’ve been developing the student research topics year-to-year. Each of the 2018 student research groups started the summer with a faculty-authored topic overview. These documents, linked below, were meant to draw some boundaries around each research area and give the students interested in the project somewhere to start. The students were primarily in charge of further defining the scope of the research efforts over the summer. In addition, each student group came up with a sort of summary illustration to use with their presentations at the end of the summer. We’re very impressed with how they came out! 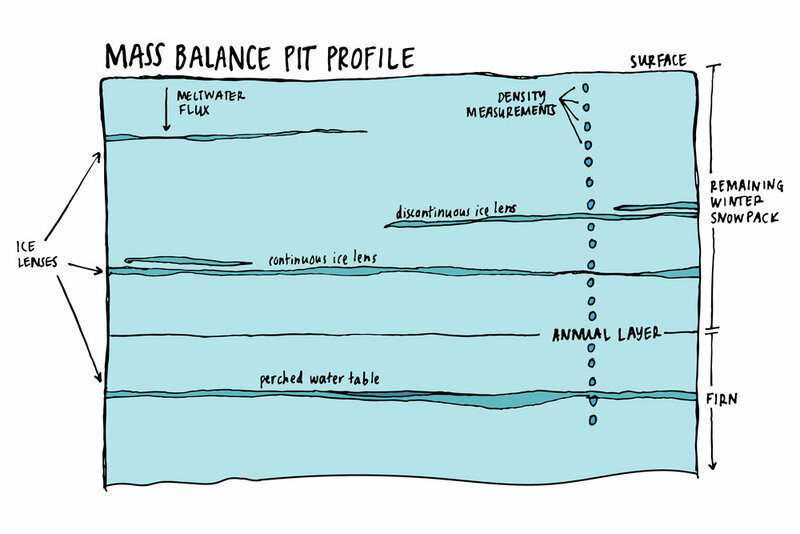 Illustration of the sampling wall of a mass balance snow pit on the Juneau Icefield. Image credit: Mia Vanderwilt. Illustration of GPR imaging of the snowpack and ice/bed interface. Image credit: Bertie Miller. Isotope Geochemistry sampling methods. Image credit: Nadia Grisaru. Plant succession and soil development in progressively deglaciated zones. Image credit: Abby Case. Glacier velocity and surface elevation loss on the Canadian side of the Juneau Icefield. Image credit: Grace Juneau.